Arrow Sewing Cabinets: Get Ready For Shirley! I need that cute table so badly so my dining room looks neat and tidy with my machine on it. I think this table would look great with my machine on top of it in my sewing room. I love this cute table. She would love my spot in front of a window!! OMG!!!! This table would be so wonderful!!!! I would love to win this awesome Shirley! It is exactly what we need. I just got back into sewing - this would be lovely to have. Nice sewing table! It would really look pretty in my sewing room. I checked! I am entered, let the games begin. HI, what a neat giveaway anyone can use! I've got my fingers crossed!! My husband and I bought a sewing machine for my son's girlfriend/finacee for Christmas. Since they are living here with us, she's got nowhere to use her machine as my sewing tables are too full and the floor space in my room is not large enough for both of us to be in here so she's using our kitchen table. As you can imagine, the kitchen table we kind of need to eat. LOL I'd love to set this up in our living room for her to use so she doesn't have to put her machine away each day and so she has a place to call her own for her sewing. I would love to win this! Thank you so much! Penny Phillips! That's my comment above! Thank you! That is too cute, a must have! I would love to win a cabinet!! I'm redoing my sewing room and this table would be perfect! Would love this for my new sewing room! HELLO,CUTE,JUST WANT TO SAY SO SWEET TOO!GREAT FOR MY LONELY SERGER! Would love to win this gorgeous cabinet. I would love this cabinet for my sewing machine. If I had this I would sew more often. My cabinet is so old my sewing machine jumps all over. Never owned a new cabinet, sure would be cool to have something in my sewing room that is not 2nd hand. Thanks for the chance, cause I wanna win!!!! This would be perfect for my 13 year old daughters machine! I would really love this table. I would love love love this table.. I would love to have this in my sewing room! 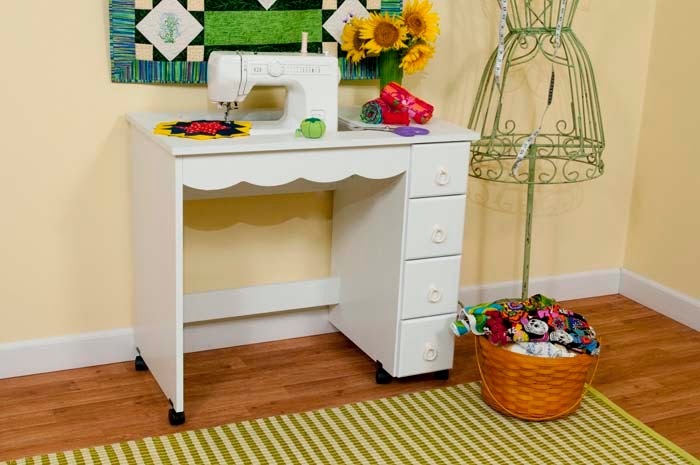 HELLO,Very cute sewing table.I would love to have a table that sat my sewing machine down and even with the top?It must make sew alot easier?well thank you for the givaway?